As anyone who was fortunate to attend will confirm, the 50th Anniversary reunion celebrations of the DHS Class of 1963 were a spectacular success. Congratulations to Tony Daymond and his committee for all of their efforts to ensure the great success of the reunion weekend. Before I perhaps bore you with details of the reunion events, let me tell you that photographs taken at the Friday night cocktail party (which included a few other class year members) and the Saturday dinner (which didn’t) can be viewed at nauticalimages.co.za – click on events and select DHS reunion to locate the relevant photos. A selection of those photos can be found on this website - go to the tabs "Gala Reunion Dinner Photos" and "Reunion Cocktail Party Photos". Have fun with the identifications if you did not attend the reunion! The first event was a special assembly at DHS in honour of the Old Boys. It was held at 11.00 a.m. in the Memorial Courtyard, which is the area that is between the old hall (now the media centre) and where the secretary’s and headmaster’s offices were in the old building (the memorial wall is about where the old toilets used to be, almost at the Vause Road boundary). There were about twenty members of the Class of 1953 present, and about a similar number of our Class of 1963. 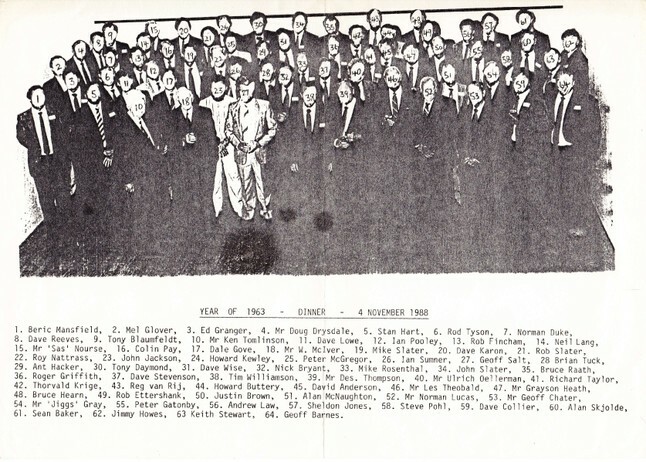 Representatives of each class addressed the gathering – Ant Hacker being the spokesman for the Class of 1963 (Ant's address is reprinted below.) New headmaster Leon Erasmus responded, and Jerry Oddy spoke about the events giving rise to the planting of the baobab tree to honour Bill Payn, and also about Bill Payn generally. To conclude the proceedings the pupils (I can’t get used to the description “learners”!) sang two school songs – the version we knew, and the current version (both in what I would regard as “hip-hop” style!). The pupils then stood as the Old Boys filed out among them – it was a moving experience to be sure. We assembled in the Tony Human Room – the top floor of the old Art Block – for our Class of 1963 cocktail party (a few Class of 1962 members were present also). What a nice pub! We certainly had nothing similar in our time! This was am amazing gathering, as the vast majority of class members present had not seen each other for fifty years. There were lots of conversations that started off with “oh my goodness [insert name], so great to see you again.” An absolutely fabulous experience of renewing friendships and school acquaintances. It was astonishing how our common bond had the effect that we moved seamlessly back into relationships that in most instances had lain fallow for fifty years. Definitely one of the highlights of the weekend. After the cocktail party we moved on to the general Founder’s Old Boys dinner in a huge marquee in the area where the prefabs used to be next to the New Science Building (i.e. where Sass Nourse used to throw stuff!). We heard a provocative speech by Steven Saad that provided further evidence of what we were all surprised to learn about the challenges that the school faces in adapting to the competitive environment for attracting star schoolboy athletes that is now the norm, in the context of the elephant in the room of the impact on the school of its changing ethnic composition, and how to maintain school traditions and standards in light of those changes. The School faces challenging times, but with new principal Leon Erasmus (a very impressive man) and school CEO Mike Fennell, plus the support of the DHS Foundation (underwritten by Steve Saad and Howard Buttery) there is good reason to be optimistic about the future of the School. On Saturday morning Jerry Oddy took us on a tour of the school, starting with the media centre (old school hall) and going on to the classrooms surrounding the Memorial Courtyard, past the current hall, and ending up in the vicinity of the old School bell. Jerry gave a very interesting and often humorous presentation – including a detailed discussion of how we used to get free calls at the “tickey box” on Vause Road using a pin through the phone wire! A very pleasant lunch was held at the Bella Mia restaurant – an extension of the old Durban Corporation Electricity Department Substation at the corner of St. Thomas and Essenwood Roads. By this time most class members had renewed their old associations and the lunch was a very happy – and protracted – affair. We moved on back to the School only after the seconds started playing the curtain raiser to the first team match. Having been beaten something like 70-0 by Kearsney the week before, the expectations for the first team were not high, but we loyally headed off to support the School against Hilton. The seating below the old top field was very comfortable (chairs, not terraced grass, as in the old days), and it was wonderful to see the first team run out in the familiar all navy blue jerseys (sadly, however, DHS has now conformed to the proper numbering, so the fullback is no longer number 1!). The School put up a good fight, but some handling errors cost them, and Hilton won by what turned out to be a comfortable margin. The dinner at Mt. Edgecombe Country Club (the Durban Club was unavailable) turned out to be the jewel in the crown that it was promoted as being. A number of class members who had not attended any earlier events showed up, so with the new faces and the catching up further on renewed friendships of the preceding 24 hours the cocktail party was a smorgasbord of happy reunions – especially since so many of the spouses and partners knew each other and also knew class members. At the outset of the dinner there were the usual formalities. Tony Daymond did a great job as the master of ceremonies (before revealing his comedic persona in the open mike session – see below). Bruce Hearn recited the Boarder’s grace of “benedictus benedicat per Jesum Christum Dominum Nostrum,” after providing interesting context with regard to its use by Theo and others – in particular in Blackmore’s House. Stuart Clark then proposed a toast to the School, to which new headmaster Leon Erasmus responded. Thereafter Don Allaway introduced guest speaker Lee Irvine, who presented an entertaining, humorous and interesting speech. Lee’s speech included anecdotes of his time at DHS (including a classic story of how he and Tubby Fowlis rang the School bell one night, and their getaway car would not start as the frenzied boarders crossed the rugby field in pursuit). Lee concluded by expressing the opinion that the great 1970 SA cricket team that beat Bill Lawry’s Aussies was probably better than the best recent teams – among his reasons for that opinion were that the 1970 team had two great cricketers (Graeme Pollock and Barry Richards) while the later teams had only one (Jacques Kallis), and that the among the next level of excellent cricketers the 1970 team had so many who could both bat and bowl. After that the stories rolled on. Ed Granger described the intricate details of his stunt involving the release of geese into the pool on Speech Day, while Tim Williamson hovered in the background still reluctant, and embarrassed – even after 50 years – to confess that he was a co-conspirator! Tim did however take to the mike to confess that he was the person who caused the School swimming pool to be chemically discoloured. Another bell-ringing story was contributed by Tony Daymond (his co-conspirator being Don Allaway), and Bruce Raath entertained us with some anecdotes about Jiggs Gray – including how he would get his runners (of whom Bruce was one) to run over the cricket pitch in spikes just to piss off Theo! It was a measure of the success of the evening that the only way that the club staff was able to get us to leave was by switching off the lights – after repeated attempts to switch the lights off and on did not have the desired effect. The evening did not end there for some of us – a group of folks staying at the Oyster Box kept up the party on returning to the hotel – including Nick Bryant, Mike MacNab, Rex Butland, Malcolm Hilcove, and Stuart Clark. All in all the reunion was undoubtedly a once in a lifetime event, and something that those who were lucky enough to participate in will never forget. An amazing few days - it was really great seeing so many familiar - and unfamilar faces - the whole fibe was special and the Saturday Gala evening was just outstanding. A special thanks to " mossie " and the organising committee - a job well done - the bar has been set very high for the Class of 64. An additional thanks to those who traveled from all over the world. What a weekend-thankyou guys for a most fantastic time-sorry could not be there on Saturday evening but I bet you all had a great time again. Once again thank you- Jacko. The experience of meeting school mates whom I may not have seen for the past 50 years was emotional and warm. It took time for the complete recognition to filter through but, when it did in front of you stood the young man with whom you had spent so much time dreaming of the future. How much money we were going to make and how we would spend this untold wealth on unheard of luxuries. Reality is often sobering and to see so many of my friends reaching what is the prime of our lives, brought home the fact that we are here for but a short time. The overwhelming feeling expressed by those of us at the various reunion events was that to be able to renew our friendships was indeed a reflection of the high regard we all have for our school and our mates. The weekend was defined by inspiring moments, Stephen Saad’s address at the Founders dinner and particularly for me by Ant Hacker’s address to the assembled school on the morning of the 7th June 2013. I have asked Stu to make sure Ant’s address is included in the reunion report. The boy’s faces showed how much they appreciated this inspiring speech and afterwards at tea I had time to chat to the head boy and other fine young men. The class of 53 was also at the assembly and what a fine group of men they are. We were able to share experiences of life after DHS and, it was suggested that for our 60th year reunion we have our names engraved on our foreheads so we can maintain eye contact while knowing who we were talking to? The contribution that our classmates have made to societies all over the world is immense and, gave me an added understanding of how schools that produce young people with the will and determination to meet challenges are absolutely essential to our future. At the Founders dinner we were introduced to the new headmaster Leon Erasmus and heard an inspiring address given by Stephen Saad. Leon together with Mike Fennel CEO of the DHS Foundation will be leading the school into a bright future. There is no doubt that the school has been through a difficult period and is in need of the strong inspired leadership of the new team. Stephen Saad is one of the mast successful young businessmen in South Africa and, as he spoke to us I was encouraged by his energy and determination, to take DHS back to the top. Our dinner on Saturday night at the Mount Edgecombe County Club was a grand affair. The venue overlooking the golf course was superb, the food excellent and the ambiance and décor outstanding. Jan Hacker had spent the Saturday decorating the room and we arrived to tables of 8 with demure candle light and golden/navy decor. The stage was set for Stu Clark to propose the toast to the school and the game was on. We were able to move around between courses and speeches and groups formed and moved on, laughter and fun punctuated the evening. As Ant Hacked said the measure of the fun was in how the ladies enjoyed the evening and the fact that we were literally pushed out by the excellent staff, well after midnight. 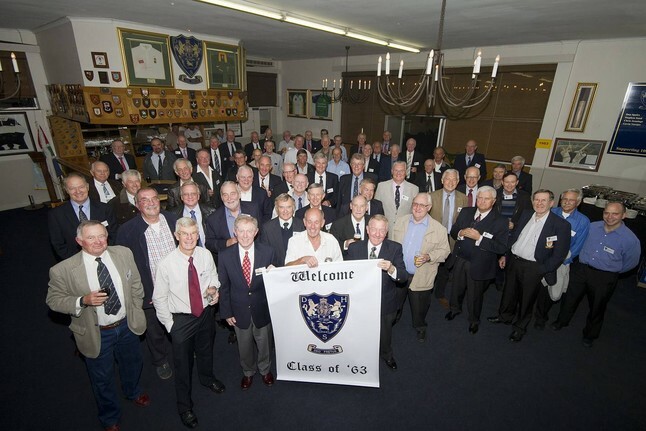 As a class of 63 we have held successful 25 and 50 year reunions, it would be ambitious to continue the 25 year cycle as we would probably have to hold the 75 year reunion in ‘another place’. Many suggested that we drop our sights to every 5 years and hold the next in 2018. A way of reaching this goal is to stay in touch and I will certainly be doing this both with our mates and the school. Our web site and the forums of communication will be open for us all to use. Hey Guys, listen up! I’ve failed matric twice, and been fired three times, so I’m sure there is a lot you can learn from a guy like me! So here I am with my mates, most of us about 67 or 68 years old, looking back at our lives and sharing memories of the wonderful times we had at this great school. So I represent the class of 63, but I can’t talk for long because most of them will fall asleep. Imagine where you’ll be in 50 years time. Where you’ll be living. How many grandkids you’ll have and knowing the contribution you have made to this world and hopefully to this great country. With hindsight, I’m sorry I did not get much from my books, but I got a helluva lot from my school. I learnt about failure and success, determination and disappointment. I learnt the importance of integrity and of great friends. And most of all I learnt about tenacity. This is a tough world. It is not fair. It is not right. But it will be as awesome as you want to make it. When you capsize in your life – and you will, at the time it will probably be devastating and perhaps even life changing. It’s only when you’re older and look back will you realise that everything happens for a reason. Only then will you be able to join the dots in the puzzle of life. I have learnt 4 things from business life that I would like to share with you. Look for what you love. Try, fail, learn and then move on. And keep doing it until you find what makes you happy. Then you’ll be good at it. Don’t necessarily do what your folks want you to do. Do what you love. Money should not be the main purpose of your endeavour. It should be a by product of what you do (Disney’s main purpose is to put smiles on kids faces). Do it well and profit will be made. Put people first. Trust them. Recognise and respect them. Challenge them. And let them fly. And they will in turn lift you up. And lastly, and no one else will tell you this … business is simple. Business is simple made complicated by clever people. So keep it simple. This is a wonderful world, and we live in a wonderful country. * Of course there are problems in this world – always have been, always will be. * Of course there are problems in this country – always have been, always will be. Do you see problems or do you see opportunities – Thinks about this! I would rather be an optimist and wrong than a pessimist and right. What are you going to do that will make a difference to your family, your friends, your colleagues, your community, your town, your country. No matter how small, you can make a big difference. I believe in South Africa we need to be entrepreneurial and to go out and start something. You don’t need money, backing or business plans – that comes later. You need imagination and hunger and guts and tenacity - the things that you have learnt at this great school – and you may fail at first, or many times, and that’s okay. Take it from me, you can have some failures. The trick is to pick yourself up, not to quit, try again, and you will be successful. But most importantly you will feel good about yourself and the difference you have made. And finally – enjoy your life, you only have one shot at it! Attendees at the 50th anniversary reunion cocktail party appear below. Back row: Keith Stewart, Bruce Hearn, Dave Wise, ?, ?, Neil Laing, ?, Jimmy Howes, ?, ?, Dave Karon, ?, Dave Martin, Rej van Rij, Dave Collier, ?, Stuart Clark, Sheldon Jones, Andy Law, ?, Mike Keggie, ?, ?, Tony Daymond, Mike Slater, Trevor McPherson, ?, ?, Peter Lawson, Ant Hacker. 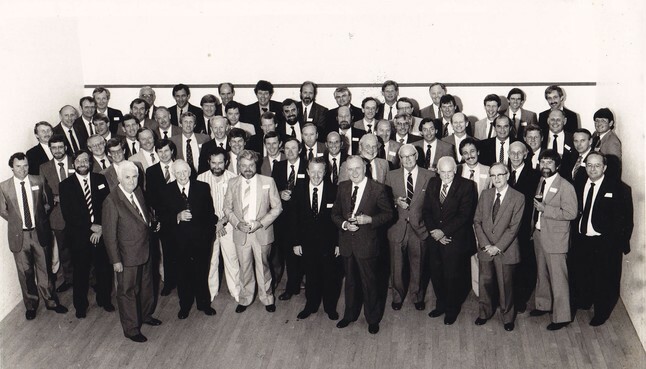 25TH ANNIVERSARY REUNION PHOTO AND ATTENDEES - LOOKING BACK! Attendees at the 25th anniversary reunion of the Class of 1963 appear below.